Chicago made history last night with the election of the city's first African American female and openly gay Mayor. 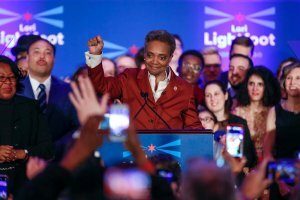 Lori Lightfoot, 56, won the April 2nd runoff election, defeating Toni Preckwinkle who is President of the Cook County Board of Commissioners and previously served in the City Council for 19 years. Lightfoot is a first-time candidate, having worked in private legal practice at the firm of Mayer Brown, after servihg as a federal prosecutor. Most notably she was the former President of the Chicago Police Board and was known as a civilian watchdog for the city's cops. Lightfoot becomes just the second woman elected mayor, following Jane Byrne, who served one term from 1979 to 1983. In February Lightfoot emerged as the surprise frontrunner among 14 candidates in the primary who were vying to succeed Mayor Rahm Emanuel, who decided against running for a third term. That included William Daley, the son and brother of two past Chicago mayors and a chief of staff to former President Barack Obama, who finished third in the field. Chicago is the largest city in the United States not to limit the term of service for its mayor. "Out there tonight, a lot of little girls and boys are watching. They're watching us. And they're seeing something, well, a little bit different," Lightfoot said in her victory speech Tuesday night. "They're seeing a city reborn - a city where it doesn't matter what color you are, and a city where it surely doesn't matter how tall you are ... a city where it doesn't matter who you love." Lightfoot will be sworn in May 20th, and will join seven other black women currently serving as mayors in major U.S. cities, including Atlanta and New Orleans.